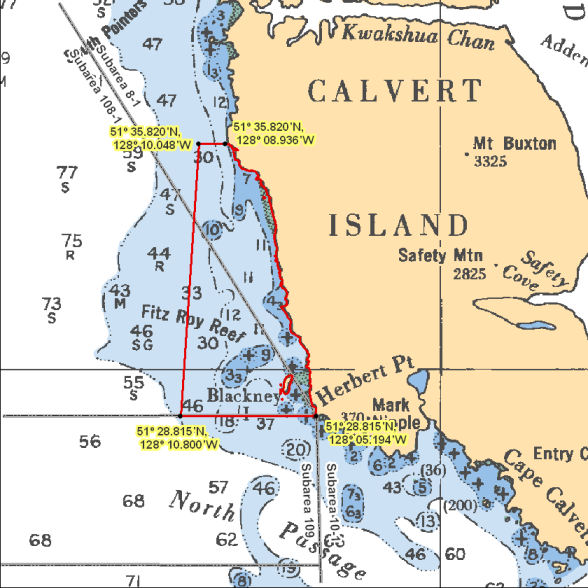 For a written description of Areas please see the Pacific Fishery Management Area Regulations 2007. Area 8: Download a printable PDF version of this map. Area 108: Download a printable PDF version of this map. You're responsible for understanding the regulations and restrictions that may affect an open fishery. Check the Area map. You need to know the location (subarea) where you plan to fish. Check the Species regulations table for fishing opportunities and basic regulations. Check the Restrictions table for special exceptions and more detailed regulations. Get to know the locations of protected areas. Permanent fishing restrictions are in effect in these areas to protect fish and fish habitat. Always check for protected areas. Salmon Coastwide Daily Limit Pieces 4 - The daily limit for all species of Pacific salmon from tidal and fresh waters combined is 4. Individual species limits also apply. Chinook Salmon Coastwide Reminder Chinook Salmon Annual Aggregate Counts - The total annual limit for chinook salmon is 10 from all tidal and fresh waters (combined). Coastwide Reminder Keeping your chinook salmon? You must record (in ink) all retained catch on your Tidal Waters Sport Fishing Licence. Coho Salmon (Hatchery) Coastwide Reminder Hatchery coho (marked): Coho salmon with a healed scar in place of the adipose fin. Reminder The possession limit is either of: one (1) halibut measuring from 90 cm to 126 cm head-on length, OR two (2) halibut measuring under 90 cm head-on length. Coastwide Gear Restriction Rot Cord - All crab traps must have a section in the top or sidewall that has been secured by a single length of untreated cotton twine no greater than No. 120 (approximately 5 mm or 3/16 inch diameter). This twine is often referred to as rot cord. On deterioration this must produce a rectangular opening with a minimum size of 7 cm x 20 cm, or a square opening with a minimum size of 11 cm x 11 cm. This regulation is intended to ensure that if the trap is lost, the section secured by the cord will rot, allowing captive crabs to escape, and preventing the trap from continuing to fish. On traps with a rigid frame and a freely opening hinged lid the trap lid must be secured by a single length of untreated cotton twine no greater than No. 120 so that the trap lid will open freely when the rot cord is broken. No other fastenings may impede the hinged lid of the trap from opening. Coastwide Gear Restriction Gear Permitted Maximum of 2 ring nets, dip nets or traps or combination of these per fisher. Ensure gear is properly marked. Hand picking is permitted including by diving. No sharp-pointed instruments are permitted for harvesting crab. It is illegal to use snares in catching or attempting to catch crabs. Reminder Keep navigation channels clear of buoys and lines. Any fishing gear that interferes with safe navigation can be removed under the Navigation Protection Act. Crab 8,108 Reminder Combined daily limit for Dungeness crab, red rock crab, box crab, Puget Sound king crab and all other king crab is 6. Dungeness Crab Coastwide Packaging and Transporting In order to be accurately measured, the carapace of Dungeness crab that you catch must remain attached until the crab arrives at your residence or it is consumed. Namu River The waters of the mouth of Namu River shoreward of a line from a fishing boundary sign located 180 m from a bridge at the mouth of Namu Creek on the west shore to a fishing boundary sign on the opposite side of the bay. Chinook Salmon Coastwide Reminder Keeping your chinook salmon? You must record (in ink) all retained catch on your Tidal Waters Sport Fishing Licence. Coastwide Reminder Chinook Salmon Annual Aggregate Counts - The total annual limit for chinook salmon is 10 from all tidal and fresh waters (combined). Herring 8,108 Reminder Harvesting of herring roe from marine plants or plants placed in the water for the purpose of harvesting herring roe is prohibited. Codfish 8,108 Reminder Species includes: Pacific cod, Pacific tomcod, pollock and hake but does not include lingcod. Eating contaminated shellfish can be life threatening! Closures change frequently throughout the year. It is illegal to harvest shellfish from closed or contaminated areas. Bivalve shellfish have 2 hinged shells. Because they feed by filtering microscopic plankton from the water, changes in water quality can cause unsafe marine biotoxins, bacteria, or viruses to build up in their tissue. Snails can also accumulate toxins and pollutants. Is it safe to harvest bivalve shellfish now in this location? Check for contamination in the subarea where you plan to harvest. If no contamination closures are in effect, check species regulations and additional harvest restrictions. Bivalve Species Coastwide Reminder Because of the risk of contamination, you are not allowed to harvest bivalve shellfish (for any purpose) within: (1) 300 metres around industrial, municipal and sewage treatment plant outfall discharges (2) 125 metres around a marina, ferry wharf, floating living accommodation, or any finfish net pen (exceptions described as follows) (3) 25 meters around any floating living accommodation facility located within a shellfish aquaculture tenure where a zero-discharge and appropriate waste management plan is a condition of the Aquaculture Licence and is approved by the Regional Interdepartmental Committee (4) 0 meters of any finfish net pen within an aquaculture tenure where an Integrated Multi-Trophic Aquaculture Management Plan approved by the Regional Interdepartmental Committee is in operation. Coastwide Reminder Clams: No person shall retain a Manila Clam or Littleneck Clam smaller than 35 mm, nor a Butter Clam smaller than 55 mm. Clams Coastwide Daily Limit Pieces 75 - When open, all species aggregate daily limit combined Areas 1 to 27 is 75, except Pacific Rim National Park where the all species aggregate limit is 24. Pacific Oyster Coastwide Reminder To avoid inadvertently harvesting Olympia oysters while you are harvesting Pacific oysters, do not harvest any oyster less than 5 cm in diameter. Crab Coastwide Gear Restriction Rot Cord - All crab traps must have a section in the top or sidewall that has been secured by a single length of untreated cotton twine no greater than No. 120 (approximately 5 mm or 3/16 inch diameter). This twine is often referred to as rot cord. On deterioration this must produce a rectangular opening with a minimum size of 7 cm x 20 cm, or a square opening with a minimum size of 11 cm x 11 cm. This regulation is intended to ensure that if the trap is lost, the section secured by the cord will rot, allowing captive crabs to escape, and preventing the trap from continuing to fish. On traps with a rigid frame and a freely opening hinged lid the trap lid must be secured by a single length of untreated cotton twine no greater than No. 120 so that the trap lid will open freely when the rot cord is broken. No other fastenings may impede the hinged lid of the trap from opening. Red Rock Crab Coastwide Packaging and Transporting In order to be accurately measured, the carapace of Red Rock crab that you catch must remain attached until the crab arrives at your residence or it is consumed. Shrimp/Prawn Coastwide Gear Restriction Floats - Traps must be marked with floating tag or buoy that has your name on it. This includes traps tied to a boat or dock or fished from shore. If two traps are attached to one ground-line, it is sufficient to attach a tag, float or buoy that bears the operator¿s name to one end of the ground-line. Shrimp/Prawn Coastwide Gear Restriction Maximum 4 traps or ring nets or combination of these per fisher. Coastwide Reminder Prawns with eggs: No person shall retain prawns carrying eggs, or remove eggs from the underside of prawns carrying eggs. All prawns carrying eggs externally on the underside of the tail shall be returned to the water immediately and in the manner that causes the least harm. West Calvert West_Calvert.png Those waters of Subareas 8-1 and 108-1 that lie inside a line that: begins at 51°28.815'N 128°05.194'W Herbert Point then to 51°28.815'N 128°10.800'W in water then to 51°35.820'N 128°10.048'W in water then to 51°35.820'N 128°08.936'W Calvert Island then southerly following the shoreline to the beginning point.